A Nordik Walking Station is a 100% Nordic walking destination that offers routes, services and tools for beginners who want to learn and be supervised, as well as for enthusiasts who are looking for a single place to organize their training sessions, workshops or full weekends. 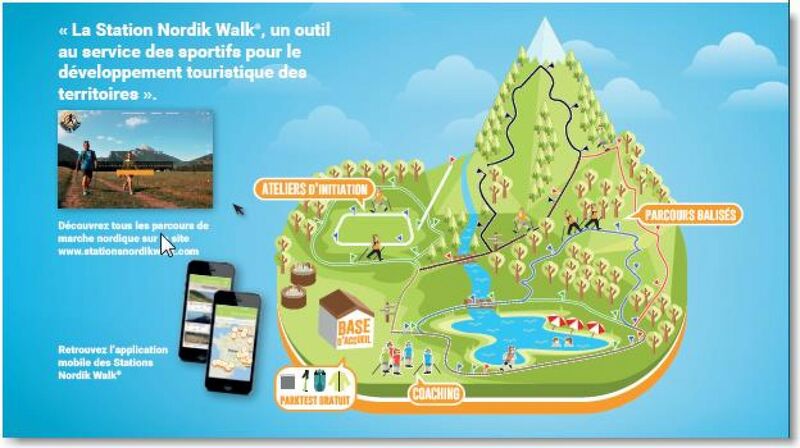 Each Nordik Walking Station is part of a territory that wants you to discover its most beautiful landscapes and its best routes, and to welcome you for a day, a weekend or a week! A dozen Nordic walking routes are proposed by the Station, allowing you to practice all levels. The routes are marked out in the same way as ski runs with a colour code (green, blue, red, black) corresponding to the difficulty of the route (number of kilometres and altitude difference). Each course has its own number, which is also indicated on the tags. These are technical courses designed for training, to improve technique and specific abilities (endurance, power, regularity, etc.). Example: coast course, split course. Specific exercises, written by a sports coach, are proposed for each workshop. You will find them in free access on the website, at the reception base and in the field (sign). This convivial space includes changing rooms and showers, the presentation of the courses, the advice of an instructor, computer terminals to enter your times on the Nordik Walking Station website or download your gpx track. In some Stations you will also find: a relaxation area, a fitness room, a test area and sale of equipment, etc.. Throughout the year, the Nordik Walking Station offers Nordic walking outings, courses of all levels supervised by specialized coaches, stays, etc. Find all this information on the site or at the base. The Nordik Walking Stations site allows you to obtain all the technical information related to Nordic walking routes (practical information, free downloadable and printable topo-guides, gpx tracks, chronos, etc. ), to prepare your Nordic walking holiday (as part of a course, a race or on your own) and to share your opinions and times with our community ! Downloadable on the AppStore and Android, the Nordik Walking Station application allows you to download the geo-referenced routes to be guided during the race, to time yourself and share your time with the entire Network community, to walk safely thanks to the Security button allowing you to send your GPS coordinates in one click. More informations about the app here.